Residual pools of standing water left from above average rainfall throughout much of Ohio this spring certainly benefitted mosquitoes. Although our cooler than normal spring temperatures may have delayed the onset of "mosquito season" a bit, our current above average temperatures will put mosquito development into hyperdrive. This means mosquitoes can develop from eggs to adults in one week or less depending on the species. Look closely at standing water and you may discover mosquito wigglers (larvae) and tumblers (pupae) performing their peculiar water ballet en masse. The wigglers are descriptively named because they snap back-and-forth to wiggle through the water. Most species obtain oxygen through a breathing tube called a "siphon" located at their back end. The highly active comma-shaped pupae are called tumblers because their movement makes them look like they're tumbling through the water. They have two breathing tubes called "trumpets" that look like horns. 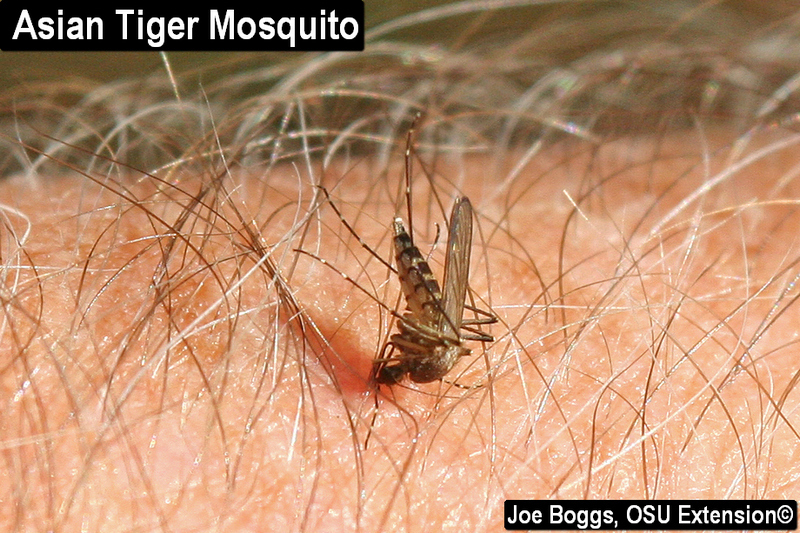 World-wide, there are over 3,500 species of mosquitoes with 59 species found in Ohio. Many species do not bite; they feed on nectar or plant sap. This is also true for males of mosquitoes that do bite; they use their piercing-sucking mouthparts on plants. It's only the females that bite so they can get blood to mature their eggs. Of course, it's not the bites alone that threaten our health unless mosquito numbers are high enough to initiate airlifts. Blood-feeding mosquitoes can transmit arboviruses (Arthropod-Borne Virus) and other pathogens. Mosquitoes in the genus Anopheles can carry microscopic worm-like parasites belonging to the genus Plasmodium that produce malaria. Mosquitoes belonging the genera Aedes, Anopheles, and Mansonia can spread the heartworm parasite, Dirofilaria immitis, to dogs, cats, and other mammals. Thankfully, we do not suffer from malarial mosquitoes in Ohio. However, heartworm is a serious threat to pets and we do have mosquitoes that carry a number of arboviruses. In 2017, there were 27 West Nile Virus cases in Ohio, 4 cases of the La Crosse Virus, and 1 case of the Jamestown Canyon Virus. So, we must remain vigilant. Many of the more common mosquito species found in Ohio will readily reproduce around or near homes, and these mosquitoes may not stray far from their breeding sites. Mosquito wigglers require some form of moisture to survive. Even temporary standing water will serve the purpose. Mosquito breeding sites can be revealed by a slow, close inspection around homes. Stagnate pools of water in ditches is an obvious mosquito generator as are outdoor toys and potted plant trays that collect and hold water. Unfortunately, it's common for gutter slopes to become compromised with age or by ice or snow loads during the winter. Changes in gutter slopes may be difficult to detect from the ground; however, climbing a tall ladder presents its own risks. Hiring a professional to inspect your gutters may be the best option – it's certainly the safest – because they have the expertise to assess gutters and proper tools to make repairs. You want the fix to be effective and long-lasting; the mosquitoes will be watching. Insect repellents may provide some relief from mosquito bites. Products containing DEET (N,N-diethyl-meta-toluamide) (e.g. Deep Woods Off!, Repel Sportsmen Max, Backwoods Cutter, etc.) have long been a mainstay in mosquito repellency. Research has also shown the products containing picaridin (e.g. Cutter Advanced Sport Insect Repellent, Sawyer Picaridin, Natrapel Picaridin Insect Repellent Wipes, etc.) or oil of lemon eucalyptus (e.g. Cutter Lemon Eucalyptus Insect Repellent, Repel Lemon Eucalyptus Insect Repellent Spray, etc.) are also effective. Remember that no insect repellent is fool-proof or ever-lasting. They must be used in strict accordance with label directions to achieve the greatest protection from buzzing blood-suckers.